Why not have a party with a difference? We can arrange children’s parties using our outdoor space, play barn and tea room. Wwe have run parties for all ages… toddlers, teenagers and even a sprightly 90 year old! Our own wood fired PIZZA OVEN is available for making and baking your own Pizzas at special events and by request for parties. 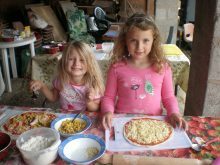 What better way to engage with food than by kneading dough , selecting your toppings and eating your pizza straight from the oven! Our Panning for Gems new attraction makes a fun addition to any party. Children love finding the hidden treasure in their individual bags of dirt. Cost is £3 bag. A new farm trailer which is wheelchair friendly is also available for farm tours. Ideal for school visits and special events – fun for the whole family. WE support lots of charities – recently EDS UK Marie Curie , RABI the farming charity and Send a Cow the African charity. Weddings can also be arranged. We have a rustic charm and can be very flexible in what kind of food and decoration you want. Great for children as we have our own play barn on site and the farm is perfect for all those wedding photos.